While traditional textile weaving has declined until only two looms still clack away on Mykonos, fashion has found its own unique expression here and it’s booming. 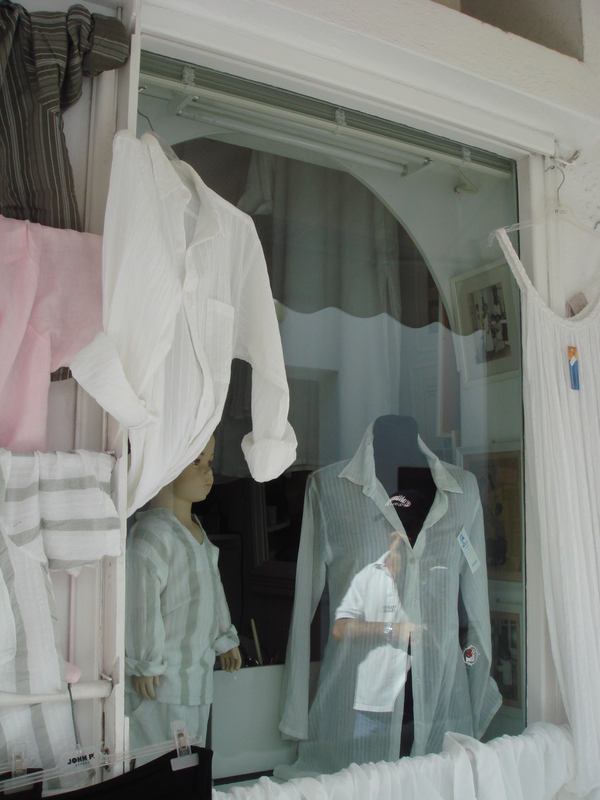 In colours reflecting the bleached Cycladic houses, the bright Aegean sea and the clear Mediterranean sky, Mykonos style favours soft, light pure cottons or linens, in shapes fitted to the hot summer sun and the relaxed lifestyle. Salachas, in Georgiouli Street, is a small shop, crammed with linen and cotton garments all of Greek materials and all locally made. Grandfather Joseph Salachas was a tailor in the 1960s and among his clients were Christian Dior and Yves Saint Laurent. It was who dreamed up the iconic knotted, bare-midriff shirt for movie star Jean Seburg. Today, Joseph Salacha’s descendants keep up the tradition. His grand-daughter helped me to outfit three little chaps in beautiful blue and white striped shirts, teamed with soft white cotton three quarter pants.